The print edition of today's New York Times carries a special section on "life after college." The section leads off with an article offering personal finance advice based on the book All Your Worth: The Ultimate Lifetime Money Plan, by Elizabeth Warren and Amelia Warren Tyagi. Yes, that is the same Elizabeth Warren who is now a senator from Massachusetts and, to believe some news articles, at least, the leading Democratic candidate for president in 2020. 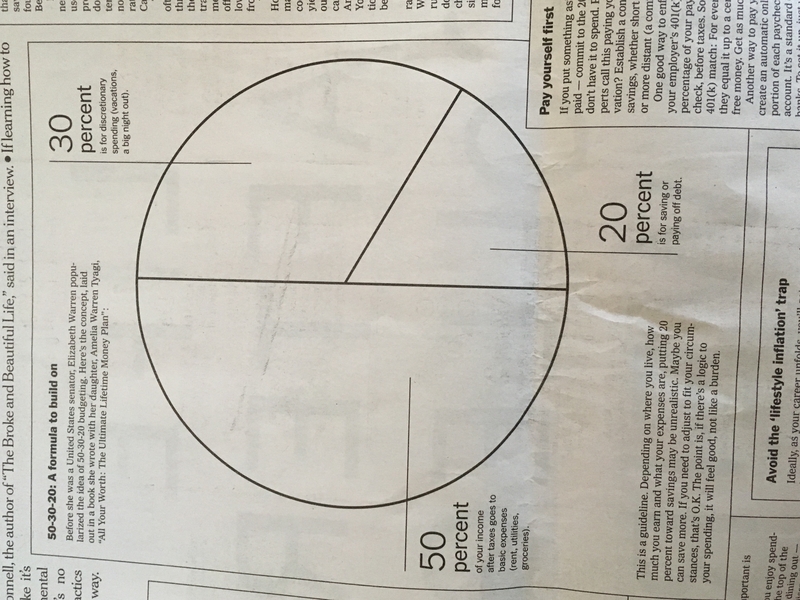 The Times, like other press accounts of the book, illustrates its advice with a pie chart of what it describes as "50-30-20 budgeting," with half of a person's money going to "basic expenses" such as "rent, utilities, groceries," 30% for "discretionary expenses" such as "vacations, a big night out," and 20% for "saving or paying off debt." What made me chuckle was the way the chart makes taxes totally invisible. On the Times-Warren chart, the combined 15.3% employer and employee Medicare and Social Security tax (which economists view as borne essentially by the employee), doesn't exist. Neither do federal, state, or local income taxes. By focusing on income "after taxes," the pie chart makes the tax burden magically disappear. That may be good for the careers of ambitious Democratic politicians such as Warren, but it conveys to the recent college graduates a subtly misleading conception of what is happening to their money. If there were a section on the chart that said "send to Washington for politicians to spend," and it were a section roughly the same size as "discretionary expenses" or "saving or paying off debt," maybe some readers might wonder if there were a way to make that pie wedge smaller. Or maybe they might figure that what they are getting in return — military protection, National Parks, health insurance in old age — is a pretty good deal. At least, though, they'd be aware that it was happening.